“He is cheerful and smart and kind of a know-it-all, but in the best possible way. He’s one of those people that finds something he knows you’ll think is cool and shares it with you.” This dream friend is Harold, the social-media persona of the Harold B. Lee Library, described here by the anonymous student employee who acts as his voice. His mission? Get a generation of digital natives excited about their library. 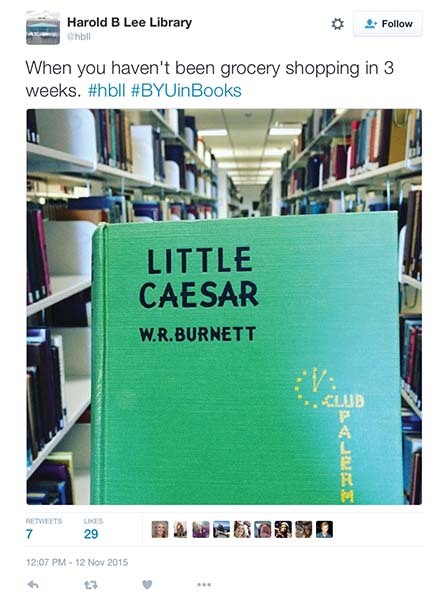 In his social-media posts, Harold has also played matchmaker to students in periodicals, host to a football-team victory lap, and party-planner to an epic Thanksgiving feast for all BYU buildings. 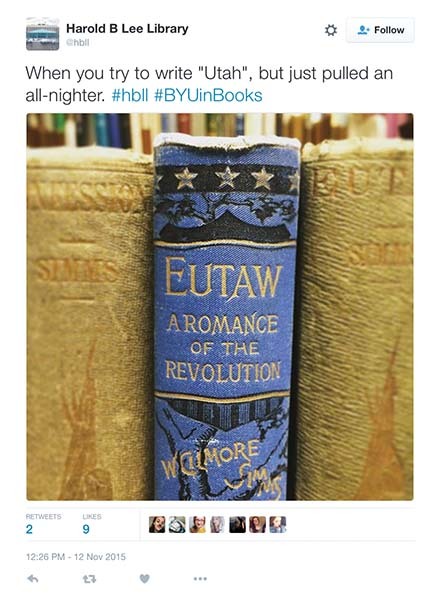 He Instagrams book suggestions for hipsters (Flannel Kisses) and students looking for romance (Finding the Love of Your Life). Occasionally he even drums up a bit of drama. In January he sent a message into the Twittersphere: “I keep trying to flirt with the @byu HFAC, but I can’t tell if it’s working.” He got a show of support from @byustore, who offered services as a wingbuilding. But when @BYUMOA threw down the gauntlet—“Not to brag or anything, but you’ll have to compete with our artistic prowess and proximity”—Harold remained a gentleman. His response—“MOA, it’s an honor to be your rival in love, and your friend in educational purpose”—capped off the exchange. According to Roger L. Layton (BA ’87, MA ’95), the library’s communications manager, maintaining an active social media presence is just one of the ways the library is remaining relevant in students’ lives. Its diverse and unique offerings—including concerts, movie screenings, lectures, exhibits, and collaborative study areas—helped BYU pass up Duke, Yale, Stanford, and more to nab a no. 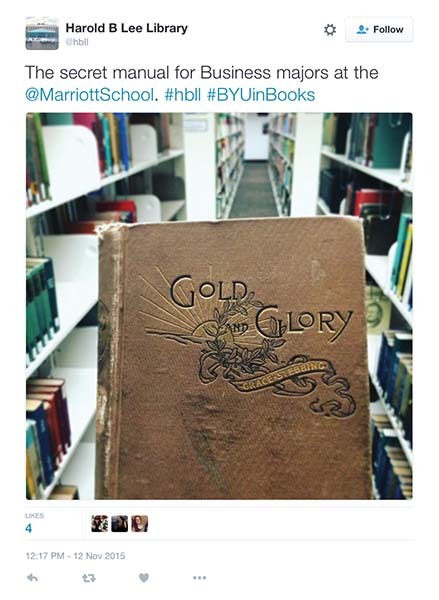 5 ranking on bestcolleges.com’s Best College Libraries 2015 list. And with students who rely on social media for quick communication and news updates, Harold can self-promote with enough humor to keep them coming back.